Before we look at the next Bible character, we must travel a long way. We must go down into Egypt; the land to which Joseph was carried by the merchants, and where he and his brothers lived for a long while. Egypt is a country often mentioned in the Bible. It is a very long valley, through which runs a famous river called the Nile. During part of the year the country is dry, like a desert; but in the month of July the waters in the river rise and spread over the land, which then looks like a red, muddy sea. When the waters withdraw, the ground is very fertile, and large fields of wheat are soon seen growing on every side. The kings of this land were called Pharaoh. The kindhearted Pharaoh who had trusted and liked Joseph had died. After the death of Joseph, a Pharaoh arose who was severe and cruel towards the people of Israel. He treated them as slaves and forced them to make bricks. He hoped in this way to destroy the people; but the more he oppressed them, the more they grew in number. Pharaoh, finding that his plan had not succeeded, ordered the nurses who took care of the infants to kill all the little Hebrew boys as soon as they were born. There lived at this time a pious man and wife named Amram and Jochebed. They had a young daughter named Miriam and also a son Aaron, about three years old. God gave them a third child who was a lovely baby boy. As they looked upon him, their hearts felt all the joy of parents. But can it be that their dear child shall be taken from them, and killed as Pharaoh had ordered? For three months they concealed him in their house, but they could not continue to do so for fear that his cries or cheerful voice would be heard. And how could they bear the thought to see him torn from their arms, and killed as other infants had been? What could they do in their distress? Was there any help for them? Yes, there was help for them in God. He could take care of their child; and to Him they resolved to commit their dear baby. Their plan was soon formed, and they prepared to carry it out. On the banks of the River Nile there grew a plant called papyrus, from which a kind of paper was made. The parents got some of this plant, and made a little ark, or boat, just large enough to hold their child. May we not suppose that as they plaited this cradle-boat, they often lifted up their hearts in prayer to the Lord? And how many tears must have fallen from their eyes as they looked upon their baby boy, and thought that the time was come when they must leave him, and perhaps see him no more! But we are told in the Bible that they had faith; they believed that God, who had put it into their hearts to make the ark, would use it to save their child. They did not know in what way he would be saved, but they were sure God would do it in some way. For "with God all things are possible." Matthew 19:26. The ark was at last completed, and covered with a kind of pitch, so as to keep out the water. When the baby was laid in his strange cradle, how the family must have stood around; and before the ark was taken away, what sweet loving kisses must Miriam and Aaron have given to their little brother! And no doubt the parents prayed to God that He would keep their dear baby alive. The mother took it to the great river, and with her kiss, her blessing, and her prayers, she laid him among the flags, or tall reeds, "by the river's brink." In this river were many reptiles called crocodiles — large, strong, and fierce. Their bodies were covered with a hard and scaly coating, and their mouths were filled with sharp teeth; and the people of the land were much alarmed by these creatures. But the babe slept in his little ark, and knew nothing of danger. There, safely under the eye of God, he rested; no fierce creature of the land or of the water could come nigh to hurt him. When the mother had gone away, his sister Miriam stood near the spot, and watched to see what would happen. She may have been placed there by her mother, or her own love may have led her to follow, that she might know what would become of her infant brother, whom she had so often cared for. Perhaps the mother was not far off, at a place they had agreed upon. After a short time, the daughter of Pharaoh and her maids were seen coming to the spot. The hand of God brought them there, though they did not know it. As she passed down the river's side, she saw the ark among the flags. One of the maids was told to draw it from the water, and bring it to her; and when the cover was taken off, there lay the lovely baby. They looked at him and "the babe wept." He saw that they were strange faces and not those of his own dear mother and sister. God touched the heart of Pharaoh's daughter with tender feelings, and the helpless state and tears of the babe excited her pity. She knew that he was one of the Hebrews, or Jews, who had been placed there to avoid being killed by her father's order. How Miriam's heart must have beat with hope and fear, as Pharaoh's daughter looked upon her little brother! She slowly came from her hiding place, to learn what would be done with him. As the princess spoke kindly about the child, Miriam drew closer to the spot, and meekly said, "Shall I go and call a nurse of the Hebrew women, that she may nurse the child for thee?" "Go," said the daughter of Pharaoh, not knowing that she was talking to the sister of the baby. The mother was soon brought to the place, and told, "Take this child away, and nurse it for me, and I will give thee thy wages." Again the mother held her dear infant in her arms. She hastened to her home, and told her family how God had heard their prayers and saved their child. Since Pharaoh's daughter had now taken the infant under her care, Pharaoh would spare the child for her sake. The child was was no longer looked upon as the son of a Hebrew slave, but as a young prince who might come to sit on the throne. 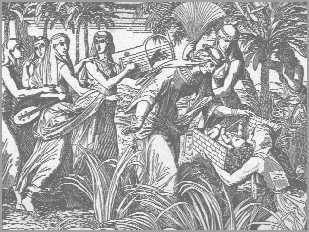 To mark the striking event, Pharaoh's daughter called the child Moses, "Because," she said, "I drew him out of the water." The name is taken from a Hebrew word which means "to draw out." Esteeming the reproach of Christ greater riches than the treasures in Egypt, for he had respect unto the recompense of the reward." Moses knew that God "is the rewarder of them that diligently seek him" and he was a faithful servant of the Lord. Moses lived to be one hundred and twenty years old and lived a useful and honorable life. His history, as given in the Bible, contains much to instruct all who read it. From the account of his childhood we learn the lesson that God can provide for little children in times of danger and distress; such as in raising up Pharaoh's daughter to adopt Moses and thereby saving him from being killed. If the mighty God of creation watches and cares for the "fowls of the air" and the "lilies of the field," shall He not care for those whom He has created with a living soul to live for ever? He surely does, and Solomon reminds the young, "Remember now thy Creator in the days of thy youth..." Ecclesiastes 12:1. For even young children can know and trust, and love and praise God. Believing in Christ, they may be a child of God, and through His merits may dwell with Him for ever in Heaven. And if God is so good to children, should they not, as Moses did, choose His service and live to His glory?